Albuquerque: The University of New Mexico Press, 1986. 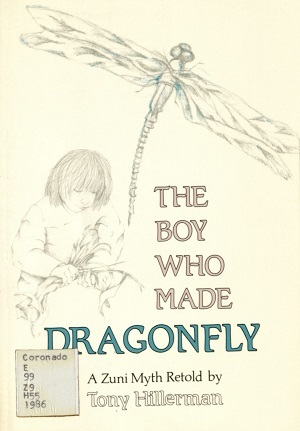 This is the new illustrated edition of The Boy Who Made Dragonfly, which is the retelling of a Zuni myth. This 1986 edition was published by The University of New Mexico Press in Albuquerque, New Mexico. The illustrations in the book are by Janet Grado. Format: Paperback, 20.3 x 13.9 cm. Binding: Full-colored pasteboard covers with the author, title, and publisher printed in black vertically on the spine.